"Right take a deep breath before you give the correct answer to the next question that I'm about to ask you, which you have heard before, hows about exhibiting some of your work this year at our fringe venue for Artweek? PLEASE ! I can't read or hear anything other than "YES O.K THAT WOULD BE GREAT PAULA, THANK YOU FOR ASKING ME" Do you get the idea? LOL"
Well I did as I was told. And Paula came round to look at some pictures. I wanted to exhibit the big standing figures I’ve been working on recently. Paula wanted a reclining figure and Emily on the white chair. 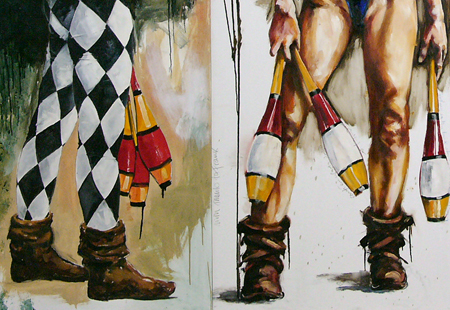 I also, for some reason, pulled out the Circus Girls from their relative obscurity in the back of the studio. 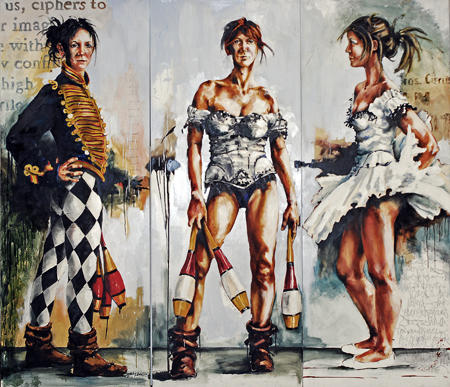 There is nothing like the prospect of an exhibition to fire up the motivation engine and turn on the creative juices. 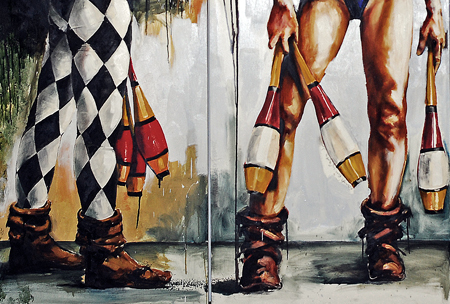 I spent yesterday giving the Circus Girls a good coat of looking at, then today I fixed up supports so I could work on six panels at once. Then I mixed up a pile of paint. So much in fact that I had three palettes on the go. One for white paint, one for smalt and one for the dark umber shadows. I put Run Lola Run on the record player, turned up the volume, picked up the big brushes and put up some paint. It's hard to see what I've been up to at this scale, so I'll put up some details tomorrow if you like. One evening in July 1967, just after tea, my brother Richard came up the stairs to the attic, where I tended to lurk, making Airfix models, creating Great Works of Art and writing secret agent letters, to my secret agent friends, with secret codes AND grapefruit juice – ha! you weren’t about to find out our secrets. Mind you we sometimes couldn’t find them out either, grapefruit juice was not the most reliable of invisible inks. Richard was carrying the local paper, the Holmfirth Express, and in his unstinting efforts to further my career as an artist, he had it open at an article about a new art exhibition in the civic hall, open to anyone. He suggested I enter. I can’t remember what his commission would be in the event of me being propelled to stardom, but I feel sure he would have had all that sort of thing covered. And in what specific length of time is it usual for someone to be propelled to stardom? . . . Overnight. Well, as it happens, I had just finished a brief exploration into the fundamental principles of Dadaism [honest], with the aid of my old Westclox alarm clock. It was a trick I'd learnt that week from Vision On. Tony Hart laid out slabs of Plasticine, in a Sixties we’re-all-having-fun-with-corduroy-and-cream-paint kind of abstract way. Then he stuck cogs and wheels into the Plasticine, and [and here’s the clever bit] he pushed bits of the cogs into the Plasticine to form patterns and the whole thing was then bathed in a stark BBC key-light which made it look far better than anything you could do at home. But I was inspired and, with the dismembered workings of my clock, the assembled household stock of brown Plasticine, and a bit of hardboard from my father’s workshop, I had created another masterpiece. Sadly without the aid of the BBC lighting engineers my genius was in danger of going unnoticed. 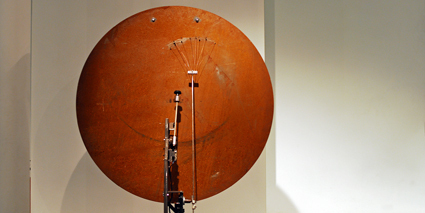 Today the piece would be called something enigmatic and be described as a surface/non-surface dialectic creating a contradiction between the cog as signifier and the cog as activator forming a dialogue between the abstract concept of time passing and the concrete reality inherent in the clockwork itself. I called it Whatever Happened to that Damned Alarm Clock? and described it as: Plasticine with cogs. Several years later, when I was helping set up one of the exhibitions, John Shaw, who ran the event for many years, said he remembered it in that first show. He gave a laugh, screwed up his eyes behind his round glasses, took a puff of his cheroot and nodded wisely. He never got one of my secret messages, but he knew art when he saw it. A whole lot of water under a whole lot of bridges. 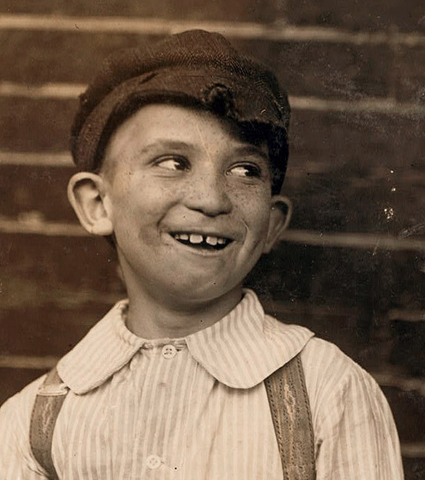 A newspaper delivery boy of Missouri in the USofA, taken in 1910. So by now he will have lived his life, maybe he’s still living it, but I doubt it, he’s what: eight or nine here? which would make him 105. What did he do with his life? Did he meet a nice girl, get married, work as a sub-editor on the newspaper and grow prize vegetables in his spare time? Did he die in the muddy trenches of the First World War? Or did he run away to sea with a broken heart and join a jazz band in Paris? In this fraction of a second, snatched from his life, everything is waiting for him. He doesn’t know what his life will amount to, but he looks like he’s enjoying it so far. And now it’s past, he has lived his life. All the minutes of all those days of all the years. And what’s left? A photograph of a cheeky boy on a website. It doesn’t do to dwell on things too much at this point. 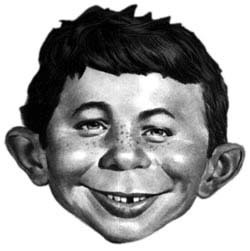 So on a lighter note, is it just coincidence or was he the inspiration for MAD comic’s front man Alfred E. Neuman? Jim [I would normally link to his site, but it seems to be enjoying some downtime at the moment, probably living up in some cyber bar in some exotic cyber location, near a cyber sea I shouldn't wonder] anyway, Jim asked me to photograph the opening of his exhibition at Kinetica in Spitalfields, London last Thursday. It was a great show, good to see Jim's work in a big space. There were lots of people there, most of whom Jim had never seen before in his life it has to be said. I lurked behind pillars capturing images on whatever it is behind the mirror of my camera that captures the images [for those who like to know this sort of thing I was using a Nikon D200]. Time was I knew what lay behind the shutter of a camera: a thin piece of plastic with an even thinner coating of chemicals whose properties are excited by light and are such that, with the addition of further chemicals, images can be projected, with a bright light, corresponding almost exactly to what was in front of the camera at the time. The chemical coatings have been replaced by tiny electrical things which are similarly excited by light, and are subsequently and almost instantly, processed by a small computer in the camera which is most probably three times as powerful as the computers used for the Apollo space mission. Such is the wonder of photography [and space travel]. The idea, from one Jonathan Smith at Comic Relief, is that children around the world make paperchain people and write messages on them to Angela Merkel, the German Chancellor, who is hosting the G8 summit in Germany in June, to make sure she remembers the G8 commitment to providing primary education for all the children here on board Spaceship Earth. Hands up if you use Google for a spell checker. I generally go on [and on] here about the struggle to create art. 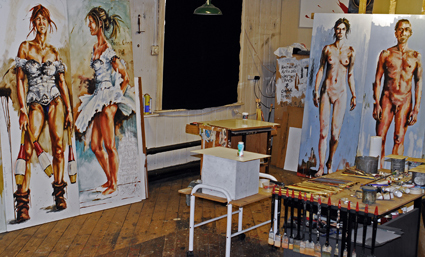 But once a painting has been created here in the studio its life is mostly wretched, languishing as it does in The Racks... “No! No! Not – the Racks!” they cry, as I cart them off to ignominy. The racks, in case you haven’t been paying attention, are at best a creative limbo where paintings go to rest for a while, away from my critical gaze. At worst they are merely a holding pen prior to The Great White Brush of Repentance. When does it become Art then? Some would say when I put down my brushes, others [god bless ‘em] when I pick up my brushes. For me it is when it is chosen. When someone buys a painting it begins its existence. Until that point It is just something I have done. 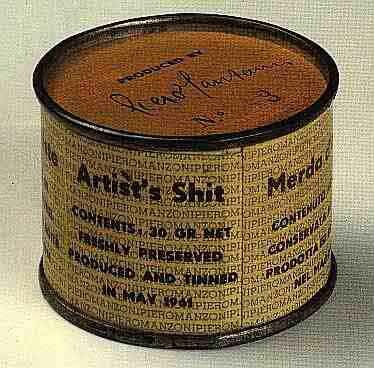 Okay, as Bruce Nauman says if I consider myself an artist then everything I do is art [and Piero Manzoni took this to its ultimate extreme in 1961, see below] but it doesn’t feel like that. There is no point that I am trying to reach, there is not a prescribed path I’m travelling along which has its outcome in Art. Before I make the marks nothing exists. But the “finished” picture has, and indeed should have, an air of always having had existed. Another tricky problem that. “It's even worse when the play is published. Whether a reader likes the play or not, it will look to them like an authoritative stream of text, a definitive statement. What I see is great black holes of missed opportunities. This is not false modesty. This is quite honestly what it feels like to open a book with my name on the cover. I'm amazed that academics haven't grasped this. Whenever an academic talks to me about my work, there's still an assumption that here is a definitive, confident text that is at my bidding. I don't disillusion them. It's much more comfortable to talk about my plays in that way than as the poor undernourished phantoms they look like to me.” Mark Ravenhill, the Guardian. A good article in the Guardian this morning, from Mark Ravenhill, about an artist’s inability to judge their own work. How true. It’s an odd transition from the studio to the public gaze. It’s often a refreshing one, always providing you can get back at the work and correct all the glaring discrepancies. This is why it’s good to have people round at the studio. Looking at or thinking about a piece every moment of every day [and don’t think that an artist doesn’t contemplate their work constantly] is always self-referential. Which is okay because that is where the work comes from. But there comes a time when the message must needs be communicated to the Great Unwashed [and the Reasonably Good Washed of course]. This is where a degree of subjective judgment is required to ensure the message/emotion is not misunderstood. Looking/watching/listening/reading a work in the company of others can be a sobering experience and serves to highlight the holes and shortfalls. We can get into a bit of a vicious circle here of course. 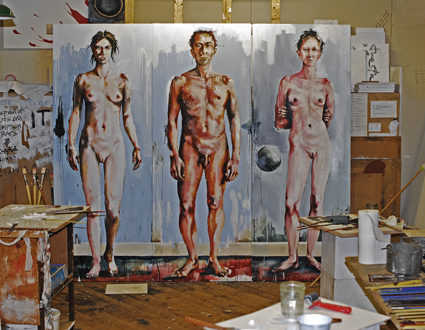 The work must remain an individual expression of the artist's feelings. It must not submit to constant change from without - that way leads to dilution and mediocrity. Though any work needs to be seen in context. Always a tricky one this. Not so much for the Silver Wedding Recorder Player, or the established artist [though there are many established artists who could do with a good coat of subjectivity] but for those who are teetering on the edge of forging a living from their creative imagination, it is a hard balance to achieve. Next time: Art and Existentialism - it is interesting that, as Mr Ravenhill says, once Out There a work is considered to always have existed, as it were. Wonderfully clear night and so a little chilly, but a spectacular event. As I stood there taking pictures every few minutes, bracketing my exposures like crazy, a dog came up and started barking at me. It snarled, wandered off and pissed on a car tyre. Next thing I know a big halogen security light flares up straight in my eyes. Now it’s hard enough to escape the sodium glare in the town here, but ruddy security lights! It was firing right at the lens too. I had to wait until it timed out before I could see again. I seem to be involved with more music than usual at the moment. I listen to music all the time, here in the studio, but I don’t know how it works. To me it is one of the great mysteries of the universe, and long may it remain so, that way I can continue to enjoy it in all its many forms. Some might say if I understood how it works I would enjoy it more, but that sort of thinking can go either way. 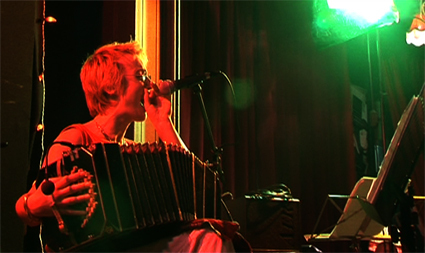 Last night I was working on a video for the Argentinean Landscape Project, a sub-tango combo fronted by Ninon Foiret. It won’t challenge the likes of Mr. Cunningham or Mr. Jonze or indeed M. Gondry, but it’s early days yet. The moon was shot one night behind my studio. Excellent music, there are two songs so far on the site, so listen to The Random Acts of Kindness.